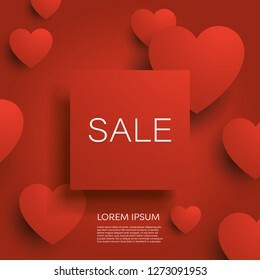 4,926 stock photos, vectors, and illustrations are available royalty-free. 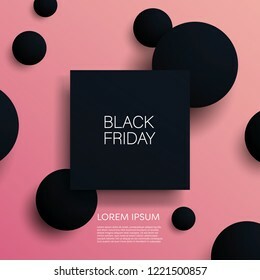 Black friday sale 3d vector illustration banner template with black objects on pink background. Sales promotion, special offers and deals advertising. Eps10 vector illustration. Business recruitment and talent headhunting vector concept in modern 3d paper cutout style. Businesswoman in spotlight. Symbol of hiring, employee search, vacancy. Eps10 vector illustration. 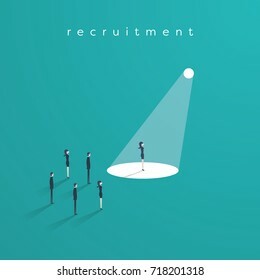 Business recruitment and talent headhunting vector concept in modern 3d paper cutout style. Symbol of hiring, employee search, vacancy. eps10 vector illustration. 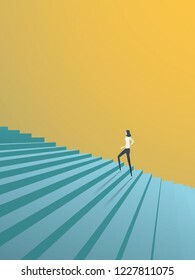 Buisnesswoman climbing career steps vector concept. 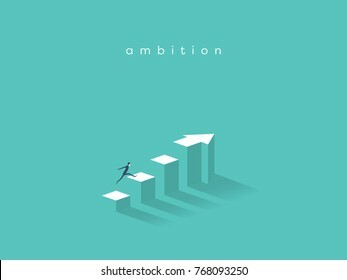 Symbol of ambition, motivation, success in career, promotion. Eps10 vector illustration. 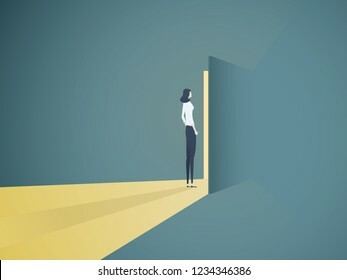 Businesswoman opening door vector concept. Symbol of new career, opportunities, business ventures and challenges. Eps10 vector illustration. Business recruitment vector concept. 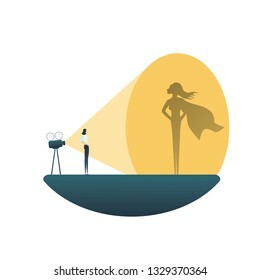 Businesswoman superhero in spotlight. Symbol of hiring, headhunting, searching for talent, skill, new career opportunities. Eps10 vector illustration. 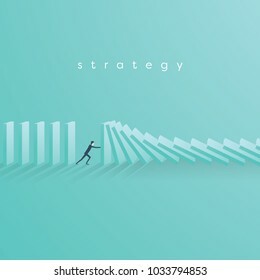 Business objective and strategy vector concept. 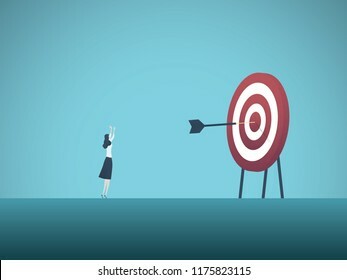 Businesswoman throwing dart at target. Symbol of business goals, aims, mission, opportunity and challenge. Eps10 vector illustration. Business objective, goal or target vector concept. Team of business people working together. Symbol of growth, teamwork, challenge. Eps10 vector illustration. Business vision vector concept with business man standing on top of ladder above clouds. Symbol of new opportunities, career ladder, visionary, success, promotion. Eps10 vector illustration. Business vision vector concept with business woman standing on top of ladder above clouds. Symbol of new opportunities, career ladder, visionary, success, promotion. Eps10 vector illustration. 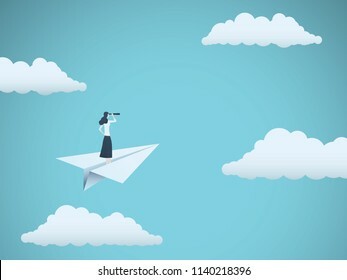 Business vision or visionary vector concept with businesswoman on paper plane with telescope. Symbol of woman leader, succes, ambition, leadership, future. Eps10 vector illustration. 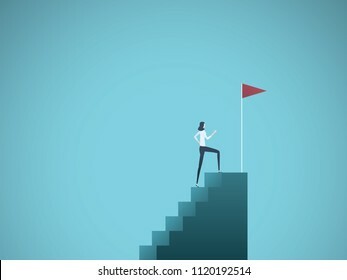 Business goal, objective, target vector concept with businesswoman climbing a cliff on a rope. Symbol of motivation, career growth, success, ambition. Eps10 vector illustration. 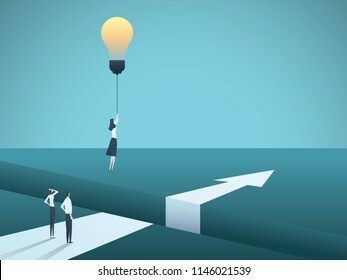 Business creativity vector concept with woman flying with lightbulb. Symbol of creative solution, breakthrough, innovation, challenge. Eps10 vector illustration. 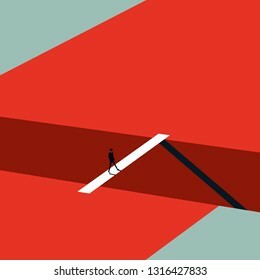 Business or career decision vector concept. 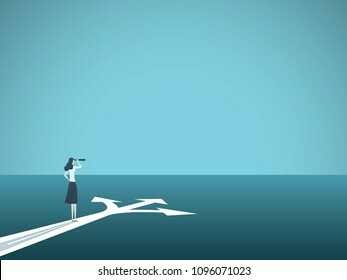 Businesswoman standing at crossroads. Symbol of challenge, choice, change, new opportunity. Eps10 vector illustration. 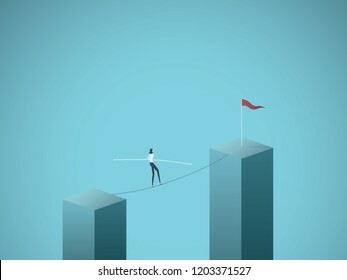 Businesswoman walking across gap on a tightrope vector concept. Symbol of business risk, courage, adventure, success and ambition, motivation. Eps10 vector illustration. 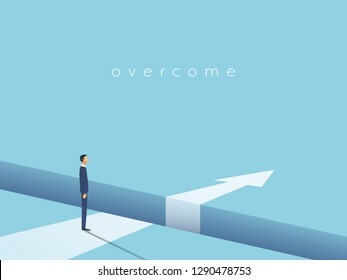 Business challenge and solution vector concept with businessman standing over big gap. Symbol of overcoming obstacles, strategy, analysis, creativity. Eps10 vector illustration. 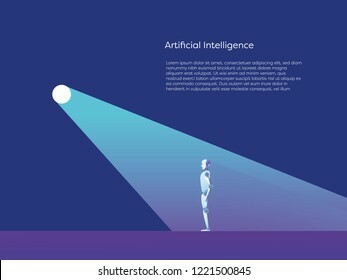 Artificial intelligence vector concept with ai robot standing in spotlight. Symbol of future advanced technology, progress and innovation. Eps10 vector illustration. 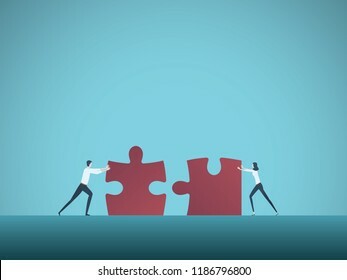 Business teamwork vector concept with businessman and businesswoman pushing jigsaw puzzles together. Symbol of cooperation, collaboration, technology, success. Eps10 vector illustration. 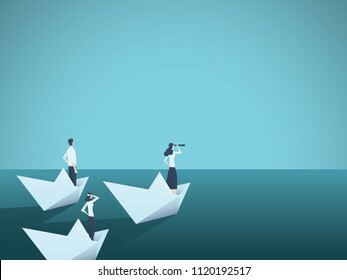 Business woman leader vector concept with businesswoman in paper boat leading team. Symbol of equality, woman power, leadership, vision. Eps10 vector illustration. 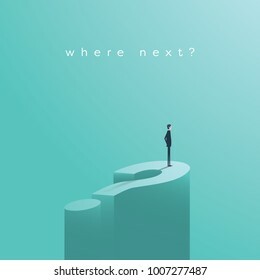 Business decision vector concept with businessman standing on huge question mark. Symbol of future, opportunity, planning, vision. Eps10 vector illustration. 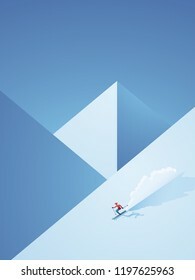 Winter skiing vector poster with skier going downhill on the mountain. Freeskiing vacation advertisement or promotion for winter holiday season. Eps10 vector illustraiton. Business solution teamwork vector concept. 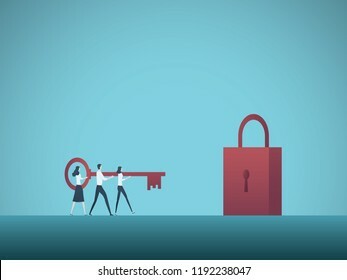 Business team colleagues unlock padlock with key. Symbol of cooperation, problem solution, new opportunities. Eps10 vector illustration. 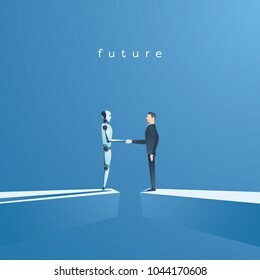 Ai or artificial intelligence vector concept with ai robot handshake with human. Symbol of future cooperation, technology advance, innovation. Eps10 vector illustration. Businesswoman scoring bullseye with dart vector concept. Symbol of success, victory, achievement of goals and objectives, skill. Eps10 vector illustration. 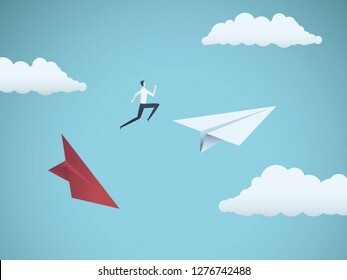 Businessman jumping between paper planes. Business symbol or metaphor for risk, danger, change, escape or bankruptcy and bailout. Eps10 vector illustration. 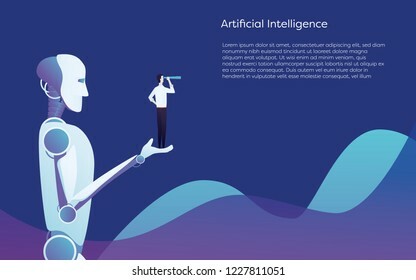 Artificial intelligence robot helping human - holding businessman in hand vector concept. Symbol of future technology, innovation and progress. Eps10 vector illustration. Public speaker or business leader vector concept. Businesswoman speaking through megaphone on a ladder. Symbol of motivation, challenge, ambition. Eps10 vector illustration. 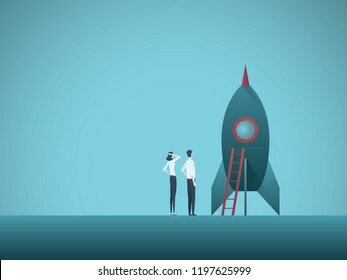 Business startup vector concept with business woman and man standing next to a rocket. Symbol of new business, entrepreneurship, innovation and technology. Eps10 vector illustration. 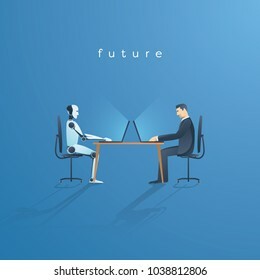 Ai or artificial intelligence vector concept with ai robot working with human. Symbol of future cooperation, technology advance, innovation. Eps10 vector illustration. 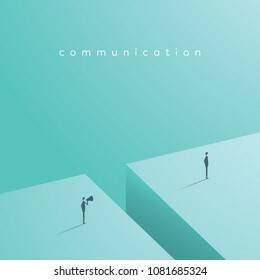 Business communication breakdown vector concept. 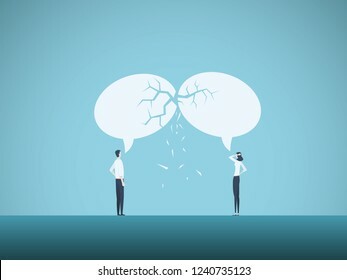 Symbol of misunderstanding, negotiation problems, miscommunication, argument. Eps10 vector illustration. 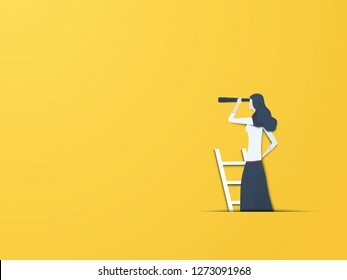 Business vision vector concept with businesswoman with telescope. Modern paper cutout style. Symbol of business visionary, leader, or new career opportunity. Eps10 vector illustration. 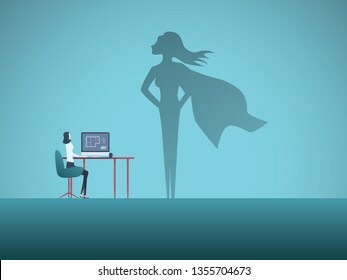 Business woman superhero vector concept. 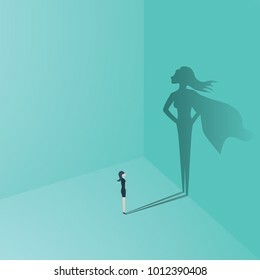 Businesswoman with superhero shadow. Symbol of confidence, leadership, power, feminism and emancipation. Eps10 vector illustration. Business teamwork and time vector concept. 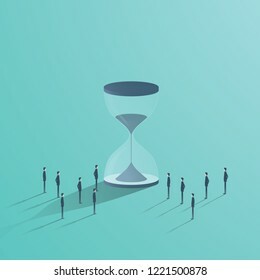 Businessmen standing around hourglass, symbol of deadline, project management. Eps10 vector illustration. Bankrupt businessman falling off a cliff, pushed by downward arrow. 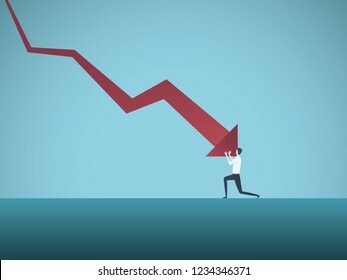 Symbol of bankruptcy, failure, recession, crisis and financial losses on stock exchange market. Eps10 vector illustration. 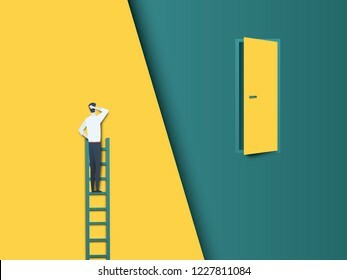 Business challenge vector concept with businessman on ladder far from door. Modern paper cutout vector style. Symbol of hard work, effort, ambition and motivation. Eps10 vector illustration. Business recruitment vector concept. 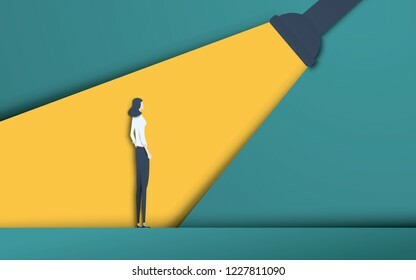 Businesswoman in spotlight. Symbol of hiring, headhunting, searching for talent, skill, new career opportunities. Eps10 vector illustration. 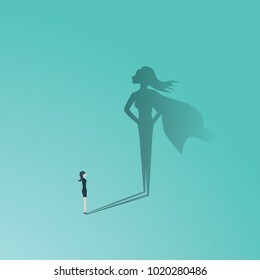 Business woman leader vector concept. Symbol of times up movement, woman in business, emancipation, success, leadership, vision. Eps10 vector illustration. 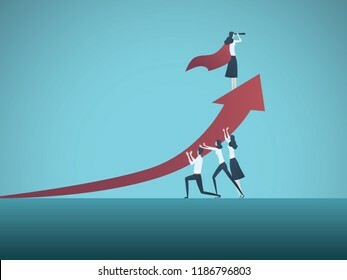 Business woman leader vector concept. 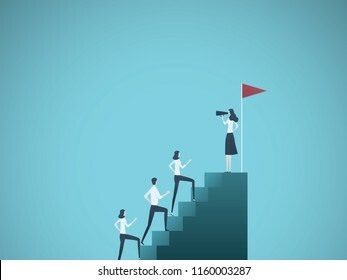 Businesswoman speaking to team climbing stairs with megaphone. Symbol of motivation, ambition, leadership. Eps10 vector illustration. 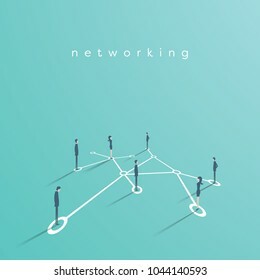 Group of business people networking, making contacts vector concept illustration. Symbol of communication, teamwork, collaboration. Eps10 vector illustration. 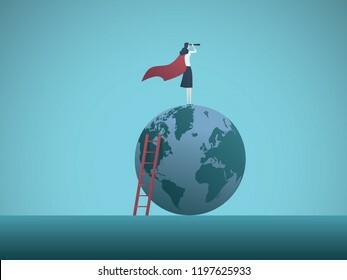 Business woman superhero on top of the world. Symbol of feminism, emancipation, success, confidence. Eps10 vector illustration. 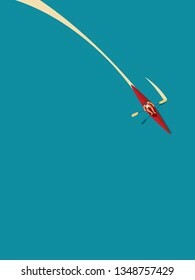 Man in canoe or kayak paddling in water, summer holiday vector concept. Symbol of recreation, sport, outdoor active healthy lifestyle, adventure vacation. Eps10 vector illustration. Business woman leader with startup symbol vector concept. 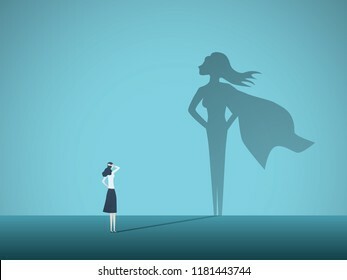 Innovative female entrepreneur, symbol of success, power, leadership. Eps10 vector illustration. 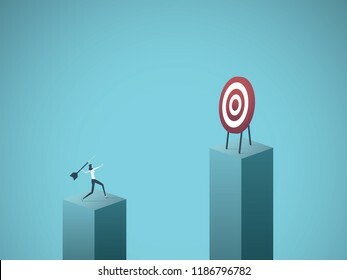 Businessman running to the top of the graph. 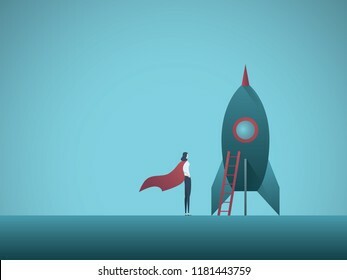 Business concept of goals, success, ambition, achievement and challenge. 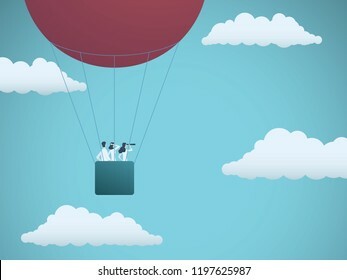 Business team flying in hot air balloon. Symbol of business vision, mission, strategy and teamwork. Eps10 vector illustration. 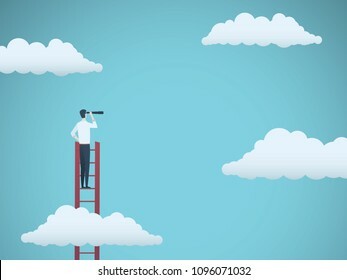 Business vision vector concept with businessman on a ladder with telescope. Modern paper cutout style. Symbol of visionary, leader, leadership concept, ambition, motivation. Eps10 vector illustration. Business teamwork vector concept. Business people working together to achieve success. Symbol of cooperation, challenge, growth. Eps10 vector illustration. 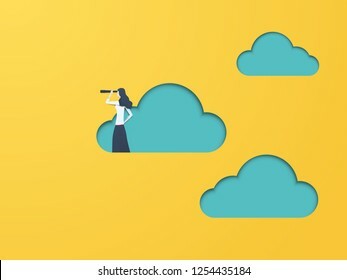 Business vision vector concept with businesswoman and telescope. Symbol of business visionary, leader, leadership concept, ambition and motivation. Eps10 vector illustration. Business determination and growth vector concept. 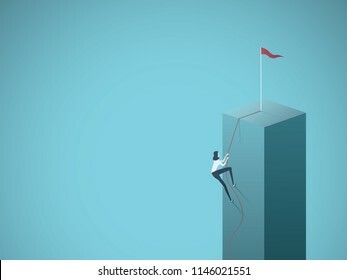 Businessman climbing vertical pillar. 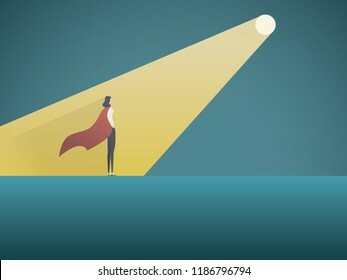 Symbol of career progress, promotion, motivation, achievement, challenge. Eps10 vector illustration. 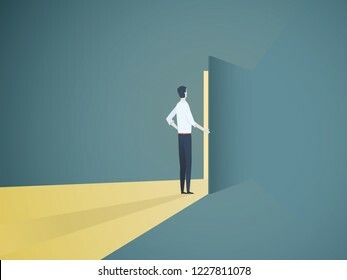 Businessman opening door vector concept. Symbol of new career, opportunities, business ventures and challenges. Eps10 vector illustration. 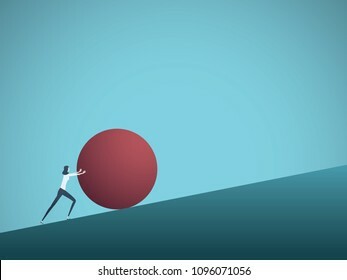 Business challenge vector concept with businesswoman as sisyphus pushing rock uphill. Symbol of difficulty, ambition, motivation, struggle. Eps10 vector illustration. 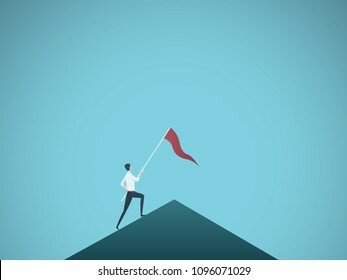 Business leader vector concept with businessman planting flag on top of mountain. Symbol of success, achievement, victory, top career and leadership. Eps10 vector illustration. 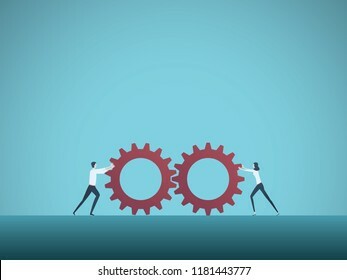 Business teamwork vector concept with businessman and businesswoman pushing gears together. Symbol of cooperation, collaboration, technology, success. Eps10 vector illustration. 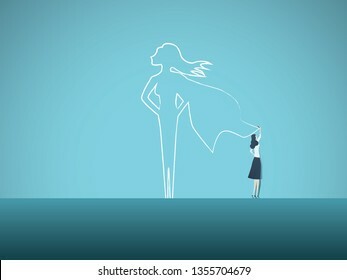 Woman at work dreaming about being superhero vector concept. Symbol of aspiration, motivation, ambition, career success. Eps10 vector illustration. 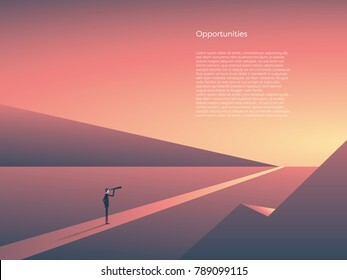 Business vector concept of new beginnings, opportunity and adventure. Symbol of career change, start, goals. Eps10 vector illustration. 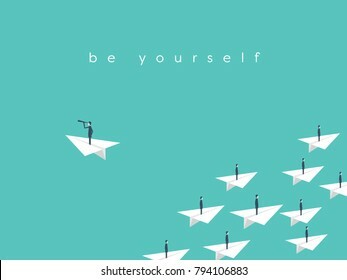 Stand out from the crowd, be yourself business concept. 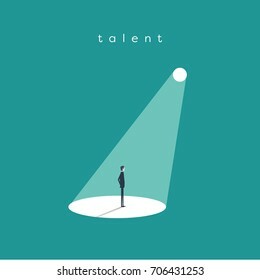 Symbol of vision, talent, individuality, unique skills, success. Eps10 vector illustration. Smart city vector concept background with IT specialist, developer, programmer. 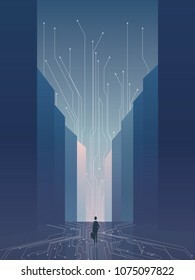 Recruitment poster template with skyscrapers skyline with digital technology background. Eps10 vector illustration. 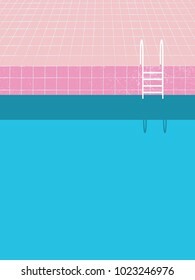 Summer pool party blank invitation poster, flyer vector template with vintage swimming pool background and steps ladder. Eps10 vector illustration. 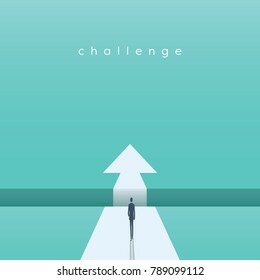 Business challenge vector concept in minimalist art style. 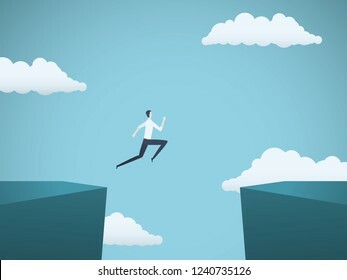 Businessman walking over bridge. Symbol of ambition, leadership, finding solution. Eps10 vector illustration. 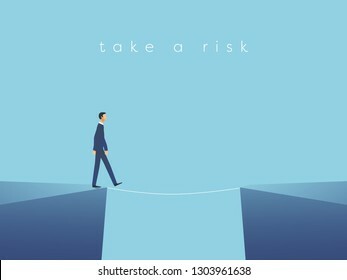 Business risk vector concept with businessman walking on tightrope. Symbol of challenge, success, overcoming and danger. Eps10 vector illustration. 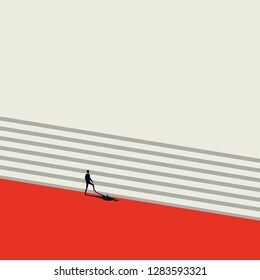 Business challenge concept with businessman walking towards gap. Symbol of success, opportunity, overcoming, ambition and courage. Eps10 vector illustration. 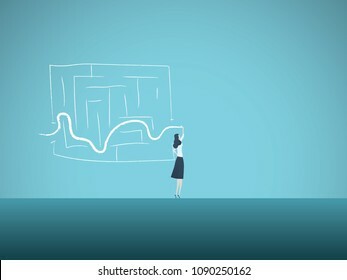 Business solution vector concept with business woman finding way through maze. Symbol of genius, intelligent woman, challenge, opportunity, planning, strategy. Eps10 vector illustration. 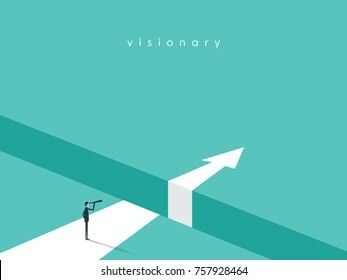 Business ambition and success vector concept. Ambitious and successful business woman climbing to top of steps. Symbol of motivation, challenge, success. Eps10 vector illustration. 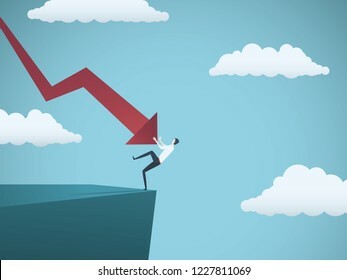 Bankrupt businesswoman falling off a cliff, pushed by downward arrow. 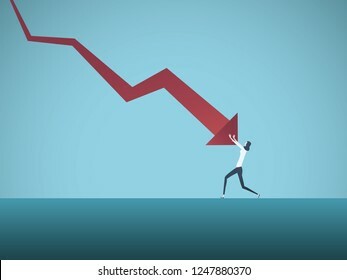 Symbol of bankruptcy, failure, recession, crisis and financial losses on stock exchange market. Eps10 vector illustration. 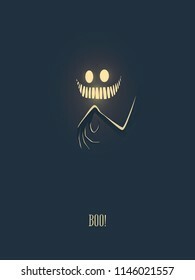 Happy halloween vector illustration card with monster glowing in the dark night, his hand with creepy fingers and mouth full of scary teeth. Party invitation card template. Eps10 vector illustration. 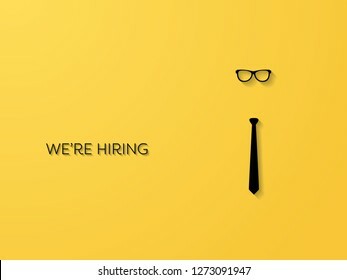 Business recruitment or hiring vector concept. Looking for talent. Businesswoman standing in spotlight or searchlight looking for new career opportunities. Eps10 vector illustration. 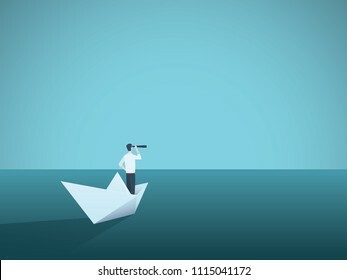 Business vision or visionary vector concept with businesswoman on paper boat with telescope. Symbol of woman leader, succes, ambition, leadership, future. Eps10 vector illustration. Business opportunity vector concept in minimalist art style. 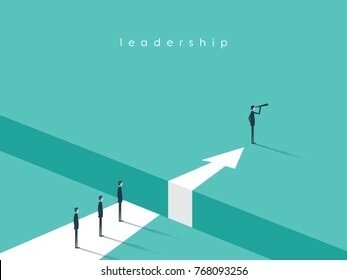 Businessman walking into gate. Symbol of new beginning, change, new career, finding solution. Eps10 vector illustration. 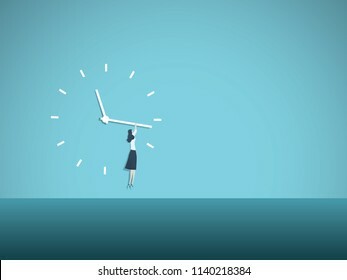 Time's up movement vector illustration concept with woman hanging on clock face. 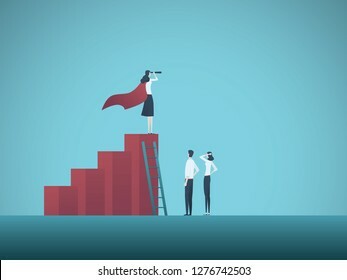 Symbol of progress, equal opportunities, salary gap, gender issues. Eps10 vector illustration. 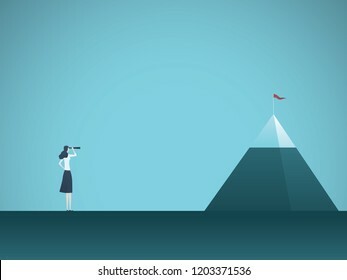 Businesswoman looking at mountain vector concept. Symbol of business goals, objectives, opportunities and vision. Eps10 vector illustration. Business solution vector concept. 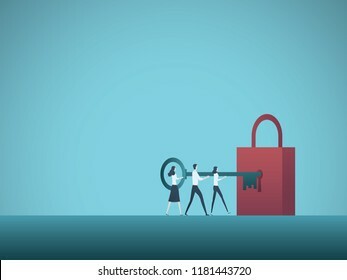 Businessman and businesswoman carry key to padlock. Symbol of achievement, cooperation, teamwork. Eps10 vector illustration. 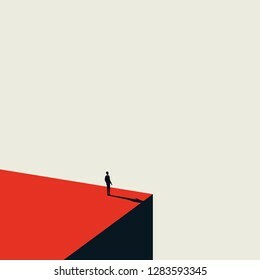 Businessman jumping over gap between cliffs vector concept. Symbol of business risk, success, motivation, ambition and challenge. Eps10 vector illustration. Business growth and success vector concept. Symbol of leadership, vision, progress, challenge. Eps10 vector illustration. 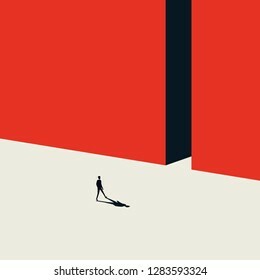 Businessman stopping falling domino vector concept. Symbol of crisis, risk, management, leadership and determination. Eps10 vector illustration. Businessman as superhero on top of the world business vector concept. Symbol of power, vision, leadership, strength, courage, ambition. Eps10 vector illustration. 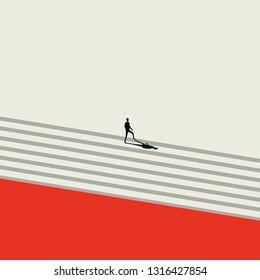 Business career development vector concept in minimalist artistic style. Symbol of growth, success, corporate ladder. Eps10 vector illustration. Business recruitment or hiring vector concept. Businessman standing in spotlight or searchlight as symbol of unique talent and skills. Eps10 vector illustration. 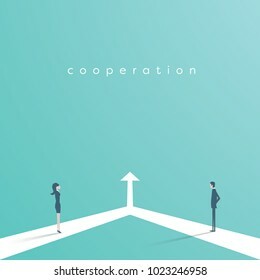 Business cooperation and partnership vector concept. 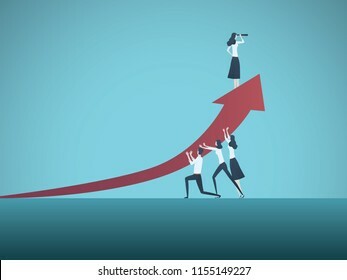 Woman and man working together for common goal. Symbol of equality, collaboration, connection. Eps10 vector illustration. 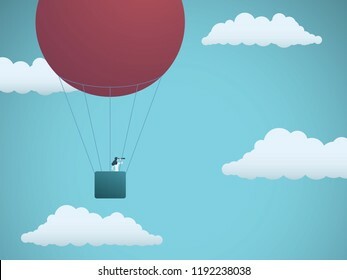 Business vision vector concept with businesswoman flying in hot air balloon in the sky. Symbol of business vision, leadership, mission, adventure and woman power. Eps10 vector illustration. Businessman pushing ball uphill vector concept. 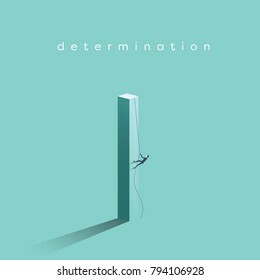 Symbol of determination, ambition, motivation and achievement. Eps10 vector illustration. 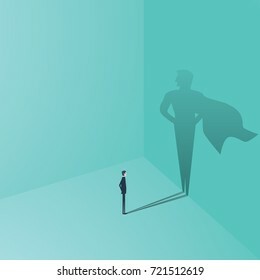 Business superhero vector concept with businesswoman projecting superhero shadow on wall. Symbol of motivation, ambition, emancipation, feminism, confidence, power and success. 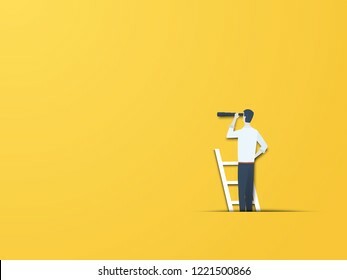 Business visionary vector conept with businessman looking with telescope over gap. Business challenge, future symbol. Eps10 vector illustration. 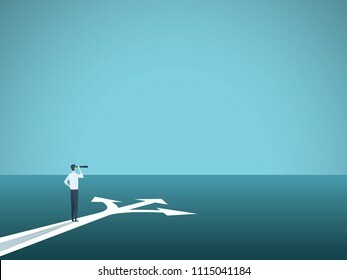 Business leadership and visionary vector conept with businessman looking with telescope. Business challenge, future symbol. Eps10 vector illustration. Business communication vector concept with one businessman shouting at another over megaphone. eps10 vector illustration.